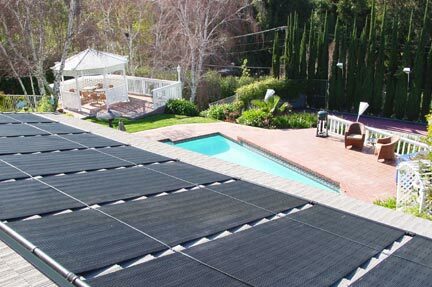 The Aquasol solar heating system is a High Quality Polypropylene panel system that's available in 4'x8', 4'x10', or 4'x12' size panels. The standard system comes with 2" or 1.5" headers making them perfect for any installation including replacement of Fafco solar panels etc. The Aquasol solar heating system is a High Quality Polypropylene panel system that's available in 4'x8', 4'x10', or 4'x12' size panels. The standard system comes with 2" or 1.5" headers making them perfect for any installation including replacement of Fafco solar panels etc. Piping is purchased locally. Just determine the surface area of your pool and purchase 50-60 % of the pool surface area in collector area. Example: A 400 sq. ft. surface area pool would use 6 - 4' x 10' solar collectors for a total panel area of 240 sq. ft.